Four quick and loud gunshots were heard in the distance. Nearly 100 yards away, we looked up to see two men in heavy trench coats, black suits, and Stetsons that covered the tops of their eyes. They stood in front of the grave of my just buried grandfather. The ground was still steaming from the freshly buried ashes. The men dropped their pistols to the ground and looked around to make sure we, my family and others attending the burial, saw what had just happened. They made eye contact with my father and then my grandmother. 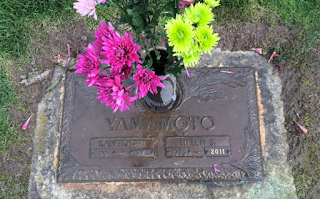 One man reached down to take the bronze urn full of chrysanthemums decorating my grandfather’s grave, and then they slowly and confidently walked in the other direction to a Black Lincoln Continental. They got into the back seats, shut the doors, and were now hidden behind the black tinted window. The car, unceremoniously slowly drives away, leaving the front entrance of the Sunset Memorial Cemetery. The men had come to make sure my grandfather was dead. The gunshots were seemingly comical and nonsensical. My grandfather was all ready dead and cremated. His ashes laid a few feet below ground. The shooting was a symbol and a message. We drove away. I do not remember where we went. I was glad to be leaving the cemetery, but I did not understand what had just transpired. Forty-nine days had passed since my grandfather had passed on December 2, 1972. It was cold, drizzly afternoon when we walked up the steps of the Seattle Nichiren Buddhist Church. I was with my father, my grandmother (my father’s mother), my mother, and brother. We were the first to arrive at the empty church. I had never been here before. We walked to the front of the church and sat in the first pew. A priest came to meet us, and my father handed him my grandfather’s ashes and small picture of him, wrapped in thick black ribbon. Several dozens other people filed into the church, mostly family and friends that I knew but also associates of my grandfather that I did not. I don’t recall if my father’s brothers, my grandfather’s two other sons, were present. In retrospect, why were they not there? Perhaps the youngest brother (Hiroshi) was overseas serving in the Air Force, and the other (Ed) could not make the trip from Los Angeles? Was it strange for them not to be there? I remember little else about the funeral – it was familiar but unrecognizable. The service was in all Japanese, which I did not speak or understand. The chanting and the sutras seemed similar to those at my own church – the Seattle Jodo Shinsu Betsuin. Five minutes, into the service, my father rose to start the incense offering. Much to his chagrin, he realized that he had done so before the instructed time. Many people, mostly family, friends, and scary looking serious men followed and made their way to gassho, an offering to the Buddha, and presumably to pay their final respects to my grandfather. The two men in trench coats who fired the shots at the cemetery later that day came late, sat in the back of the church, and quietly watched and listened. They were barely noticeable. They seemed more serious than the rest of the gathering and much less emotional. They were there to keep an eye of everyone and assessing who was and was not there. They were here on duty and on assignment, but with respect. As the ceremony ended, we all departed for the cemetery to bury my grandfather. My father clutched his father’s ashes securely in his right hand. As we walked past these mysterious men, he exposed the small bag containing my grandfather for them to see, all most taunting them. The drive to the cemetery was just 30 minutes away. It was only on this day did I know my grandfather was a Nichiren Buddhist, not a Jodo Shinsu Buddhist. Jodo Shinsu Buddhism was the form of Buddhism my family practiced, along with most of the Japanese community in Seattle. It was a bit odd that my grandfather was a Nichiren Buddhist but I didn’t think much about this at the time. 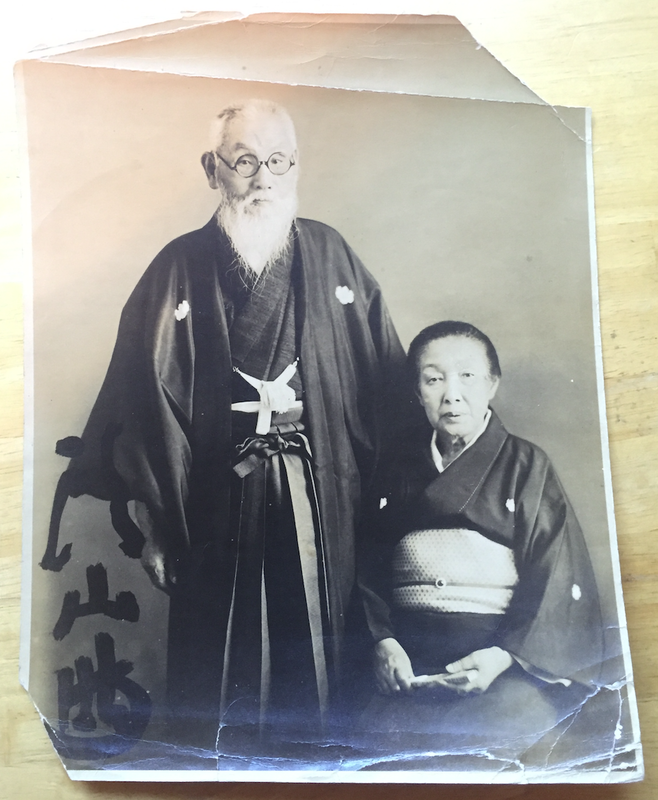 After all, he was deeply involved in the Japanese American community and even frequented the Seattle Jodo Shinsu Betsuin. 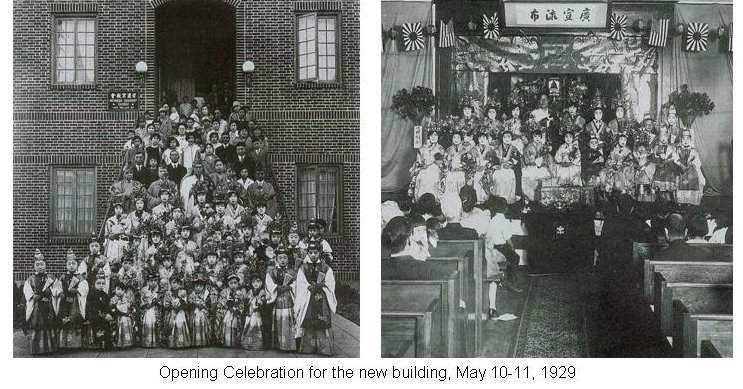 When I asked my dad about this a few years later, he casually mentioned that in 1920’s, a raffle at a church carnival was held to raise money to build a new Nichiren church building. He first bought a ticket. Then he sent an associate with a fist full of money to buy all of the remaining raffle tickets. And, then the next day, he made a donation to fund the entire church building. On September 14, 1933, my grandfather and grandmother were the first couple to be married in the new church, amid much pomp and circumstance. Years would pass, and I wondered with increasing curiosity, why Nichiren Buddhism? There seemed to be more to this story; a story that would take decades to uncover. Nichiren Buddhism (https://en.wikipedia.org/wiki/Nichiren_Buddhism) is a familiar form of Buddhism familiar to only a few in America. 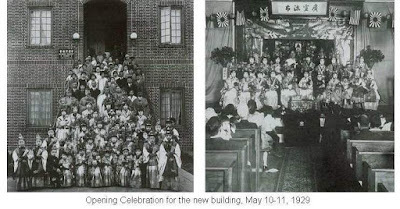 Most Japanese Americans I know think of “Buddhism” as Jodo Shinshu Buddhism (https://en.wikipedia.org/wiki/Jōdo_Shinshū) -- the Buddhism that they practice. And, I suspect Americans that are not Japanese are more familiar with Tibetan Buddhism (https://en.wikipedia.org/wiki/Tibetan_Buddhism), popularized by the Dalai Lama. I often (kidding not kidding) say that Jodo Shinshu Buddhists are to Tibetan Buddhists as Episcopalians are to Catholics. Jodo Shinshu Buddhism is “Buddhism Lite” in comparison to Tibetan Buddhism. It feels more practical, less “serious,” and more accessible. I could be wrong – I am a Jodo Shinshu Buddhist, so not ironically my understanding is perhaps lessor than if I were a Tibetan Buddhist. Behind the scenes orchestrating this coup, was Mitsuru Toyama. Toyama was a right-wing political leader in early 20th century Japan and founder of the Genyosha nationalist secret society. Toyama was born to poor samurai family in 1855 and rose to prominence as the Shadow Shogun of the Black Dragon Society. Who was Mitsuru Toyama? I’ve often asked myself this question over the years – after I found this picture of him in a family photo album.